It was an early morning for us. 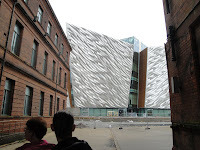 The drive from Portrush to Belfast would only be a little over an hour, but we wanted to arr ive in time for the tour we had booked online: Titanic Walking Tour. 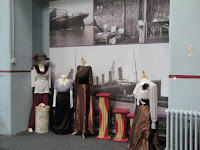 Southampton is always the port associated with the Titanic but the ship was built in Belfast, a fact that Northern Irelanders are beginning to capitalize on. Up until recently, they were a little nervous about calling attention to their building an "unsinkable" ship. Now they have realized what valuable innovation went into the building of the ship and they are taking pride in that. We met our guide in front of the hotel, the Premier Inn, that was the starting point and immediately fell in love with her. She was absolutely a Titanic enthusiast--a Titanorak, as they say. 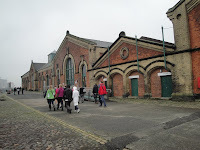 She walked us along the street that led to the yards where the Titanic was built. 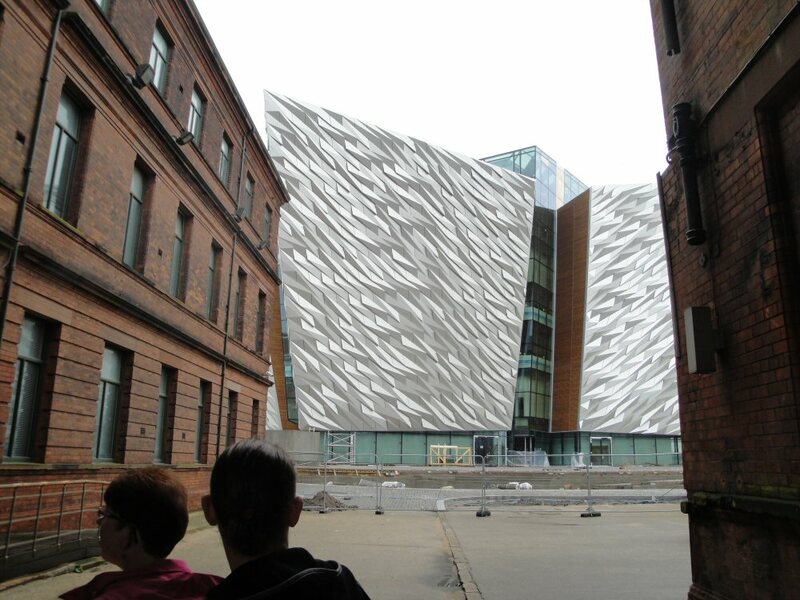 On the way, she stopped to show pictures of what it looked like back then and talked of what the future holds for this area as they construct the Titanic Quarter, a waterfront community with business, residential, and commercial enterprises that will center around the Titanic theme and preserve the historic aspects of the area. In the distance a silvery white building with an unusual shape stood out among all the other buildings. It was actually in the shape of a star if viewed from above, a white star. White Star Line was the name of the prominent British shipping company that commissioned the Titanic. 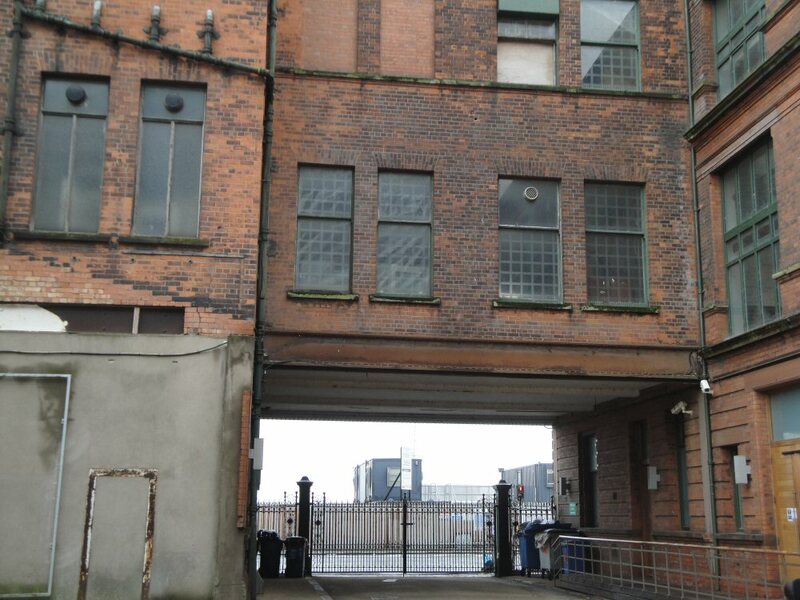 Significantly, it is the same height as the Titanic was as it sat i n that space being built. A red brick building, the former Harland and Wolff Headquarters Building and Drawing Offices, was our first real stop on the tour. Our guide stood for a few minutes outside the iron gate and helped us to imagine what it might have looked like as the workers came through that gate every morning to their job building the world's largest ship--at the time. 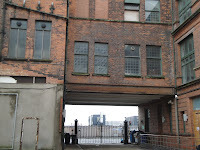 The white star-shaped building loomed in the open space beyond the gate. It looked even bigger now that we were closer and if you squinted just a bit, you could almost imagine that it was the hulk of a ship, a very large ship. How awesome it must have been to see that grow each day and be a part of the construction process. 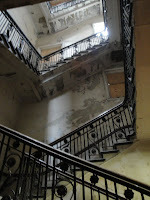 Inside, the building was showing it's age, but was still in great shape considering not much has been done to restore it yet. 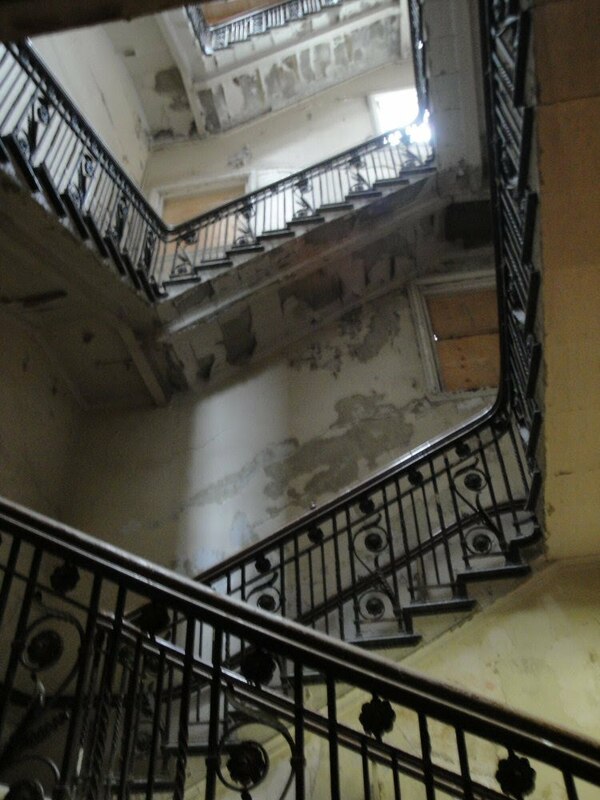 Beautiful stairways and unusual glassed in offices spoke of a time that was much more elegant than our sleek modern lines of today. Goosebumps broke out on my arms as we entered the original drawing room where Thomas Andrews designed the Titanic, the Olympic, and the Britannic. After a brief explanation that painted a picture of past times in this room with the help of a photograph our guide held up, we were left to explore and soak up the history. In the corner, was a display of clothing from the period. The Titanic was built between 1909 and 1911 when it was launched. And the fateful day was April 14, 1912 when it hit the iceberg and sank. Thomas Andrews, by the way, was lost that night as well. We exited to the street again. The slipway where the Titanic was built and launched was inaccessible due to the construction going on with the Titanic Quarter. A little ways down the street however, we were able to look through a fence and see a bit of the HMS Caroline's bow peeking out from its construction cover. The Caroline, the last remaining WWI ship in existence, still commissioned by the Royal Navy, has been docked in Belfast for 86 years. It will be on display to the when renovations are finished. At the pumphouse we grabbed a little something to eat. Here the guide collected tickets and money from those who had joined without booking online. 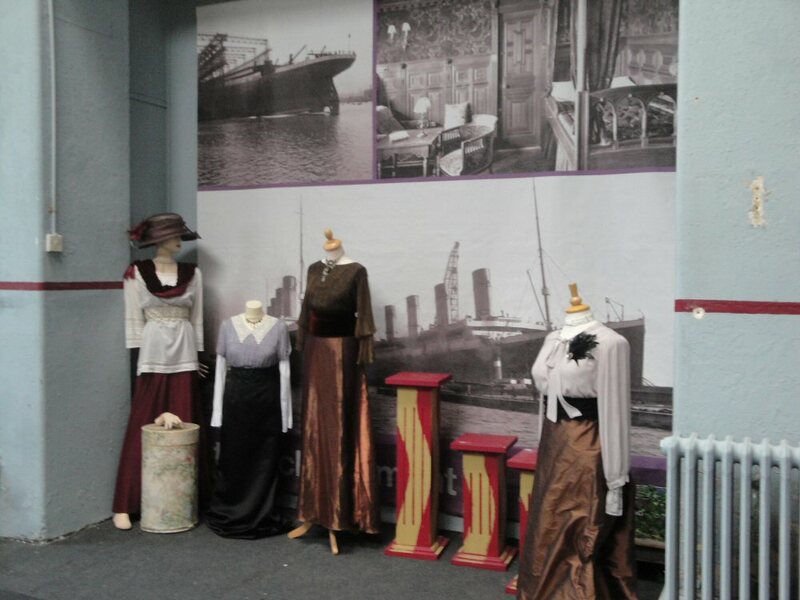 In the dining area were several pictures and video displayed on the walls of ship building including the Titanic. 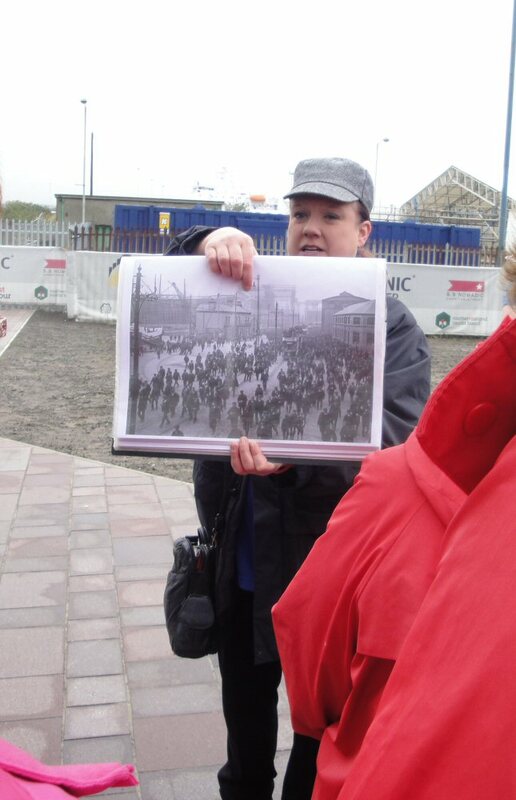 After a half hour, our first guide handed us over to a second who walked our group to the dry dock where Titanic was sent after launch to be inspected. 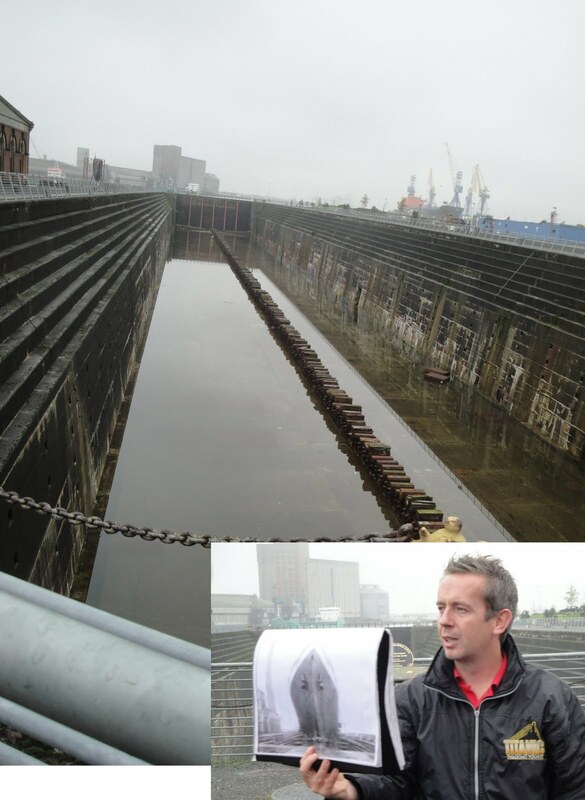 Down the center of the dry dock are the blocks upon which Titanic rested. 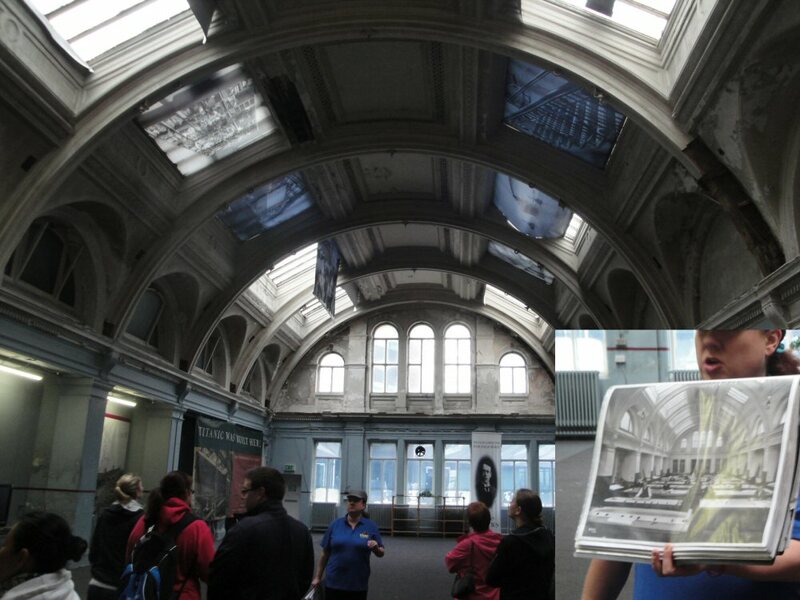 The guide held a photograph and pointed to a building nearby to try to give us perspective on the size of the Titanic. 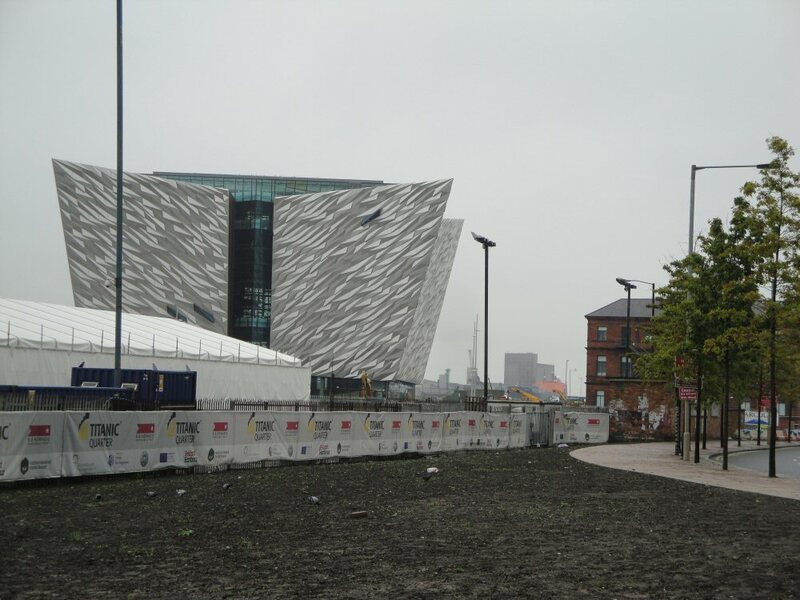 Eventually there will be a park area in the Titanic Quarter with grass and trees and in the shape of the deck of the Titanic. You will be able to walk from one end to the other as if strolling on the promenade deck. In comparison to today's huge cruise ships, the Titanic is actually small. The Oasis of the Seas is 1184 feet and 222,900 gross tons compared to Titanic's 883 feet and 46,000 gross tons. But for its day, it was the largest. 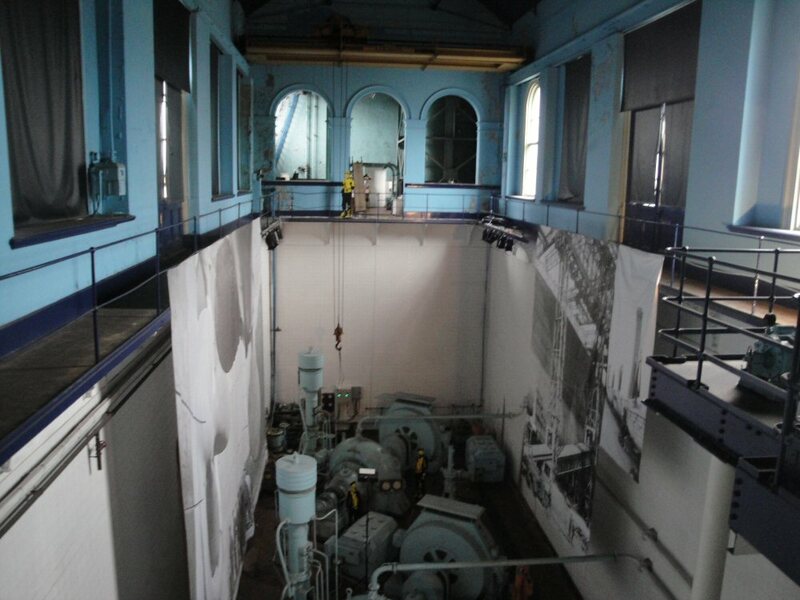 In the Pump-house, the working side, we were able to see the old pumps and view a video about how the pumps worked to pump water in and out of the dry dock so workers could repair or finish what needed to be done on the hulls of the ships they built there. 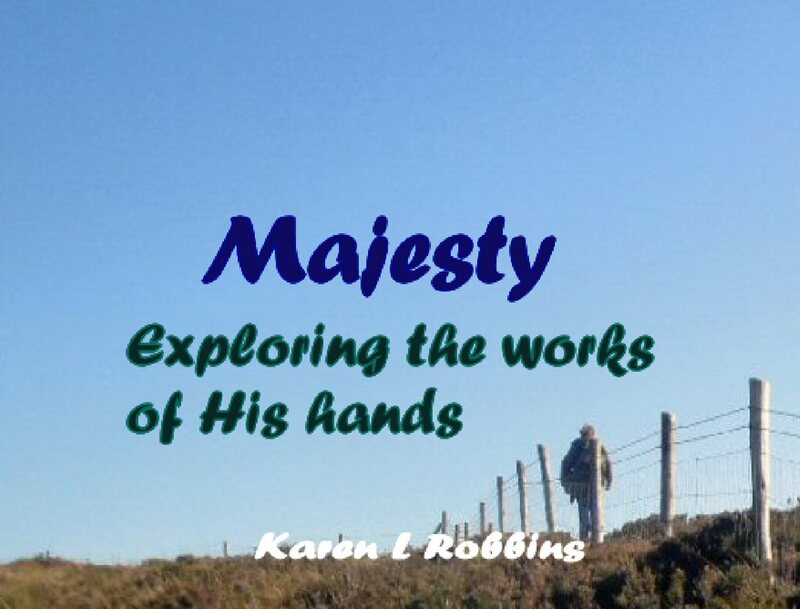 When we were finished, I was still in awe of the whole story. We have now been to every place the Titanic has a connection except for one port, Cherbourg, France, which we hope to cover on a trip in the near future (Southampton, Cobh) . We have even been over the spot where the Titanic lies on the bottom. I don't know what continues to draw me to the story of the great ship. Perhaps the little stories of all the people and how they came to be on board the ill-fated sailing. Whatever it is I guess I could be labeled a Titanorak--as long as it just means I'm totally interested in all things relating to the RMS Titanic. Thank you for sharing your Titanic adventure, Karen! I've not been to Belfast and have wondered what the places you've described and photographed look like today--what a treat to see them! 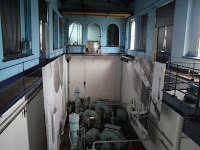 I was in Southampton a few years ago and learned so much from the museum there--fascinating! You might enjoy my new novel, "Promise Me This"--a story that begins with Titanic (and a Belfast stowaway) and goes through WWI. Thanks, Cathy. We have been to Southampton several times and the last time did a Titanic memorial walk (http://karenrobbins.blogspot.com/2011/04/southampton-titanic-memorials.html) We also visited Cobh on our Ireland trip, one of the last ports before Titanic set off on her voyage across the Atlantic. I'll check out your book. 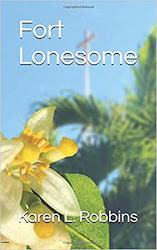 I'm always looking for books that compliment places we've been to for my travel readers to enjoy on their trips. Thanks for sharing all this. Very interesting! I've been researching Titanic for Kathy Kovach and my new book, Titanic: Legacy of Betrayal, and really enjoy good information. Paula, you may find a few more things if you search my blog. There should be a search box at the side. If not, look at my Ireland and England posts as well as Cruising. We also watched a memorial service a few years ago as we sailed on the QE2 and passed over the Titanic on the 96th anniversary of its sinking.